Knowing everything about what you purchase is very important to make full use of the product. You wouldn’t want to buy a car without knowing all of the features it offers and how they work, right? The same goes for your SEMrush account. This is the starting point of any online marketing activity—who your organic and paid competitors are, how well their websites perform, and which keywords are at play. Within our reports in just a few clicks, you will get the right keywords for your campaigns, uncover your competitors, and gather all of the analytical data you’ll need. The first big difference between the subscription plans for the Domain Analytics and the Keyword Analytics is the limits for the number of Requests per day, and the number of Results per request. A Request basically serves as a search. If you typed in a domain and were redirected to the Domain Overview, that would be one request. However, if you were to click on the traffic number listed under Organic Search from the Domain Overview, this would then be the second request. Each time you go to a different report within SEMrush, that counts as an additional request. Results are what show up for your query. For example, if you go to the Organic Positions report for a domain, each keyword would count as a result. Same goes for the exports, you would be limited to the number of results available for your subscription plan. Historical data in all our analytical reports is only available to our Guru level users or higher. Historical data allows you to see past data on any query you enter within SEMrush. Our database goes back as far as January 2012. Pro users will only be able to see our live data. Users can access this data through the Live Data box in the top right of your given report. Product Listing Ads (PLA) are displayed when someone searches on Google for a product that has a listing on Google Shopping. This type of ad is more intent-oriented and has a much higher conversion rate than the regular ad snippets, therefore serious e-commerce should pay close attention to the PLAs. For our Business subscribers, we offer reports to define competitors using Product Listings, get insights into their product feeds, and see what’s working best for them. Display Advertising reports tell you everything about your competitor's use of online display ads. You can study your competitor's banners, sidebars, and text ads placed through Google Ads and published on the Google Display Network. Being able to filter out specific data can be a key in helping you fully understand the success or failure of any given ad. Among available filters are location, device type, and time period. You are able to choose to analyze ads over the last 90 days, 30 days, 15 days, 7 days or of all time. Keep in mind that time frame filtering is only available for Business accounts. 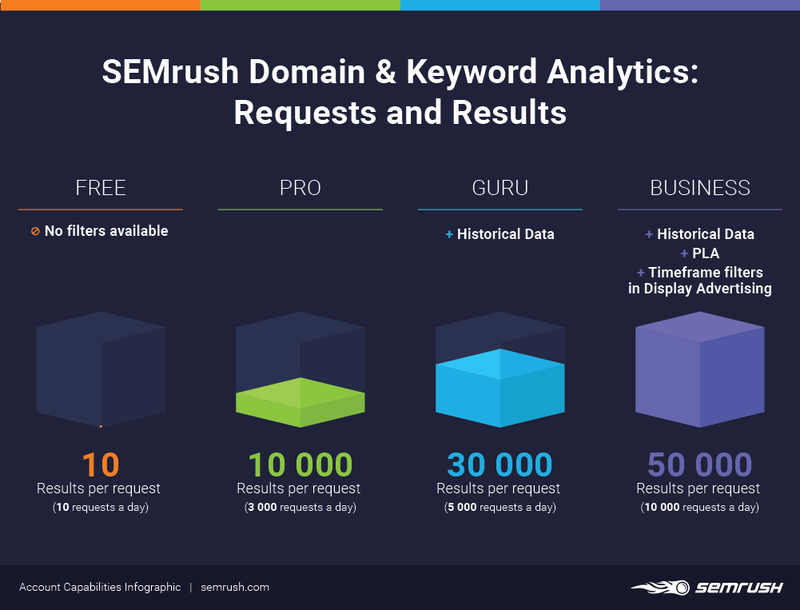 Complete access to Traffic Analytics data is available at $200 per month and can be added to any paid SEMrush subscription - Business, Guru or Pro. With these reports, you can benchmark and compare multiple websites’ performance, traffic, and user engagement, monitor trends, conduct awesome presale research, and much more. Any subscription with the Traffic Analytics add on: Complete access to all Traffic Analytics data, reports and features. Paid subscription without Traffic Analytics add-on: Ability to enter queries into the Overview report. All remaining reports can be tested using our 3 sample domains. Free subscription without Traffic Analytics add-on: Limited access to the Overview report (free accounts can make 10 total requests/day between all SEMrush reports) and all remaining reports can be viewed using our 3 sample domains. The 3 sample domains (ebay.com, amazon.com, searchengineland.com) allow you to see the features and reports of Traffic Analytics in action before deciding to add the full access to your subscription. 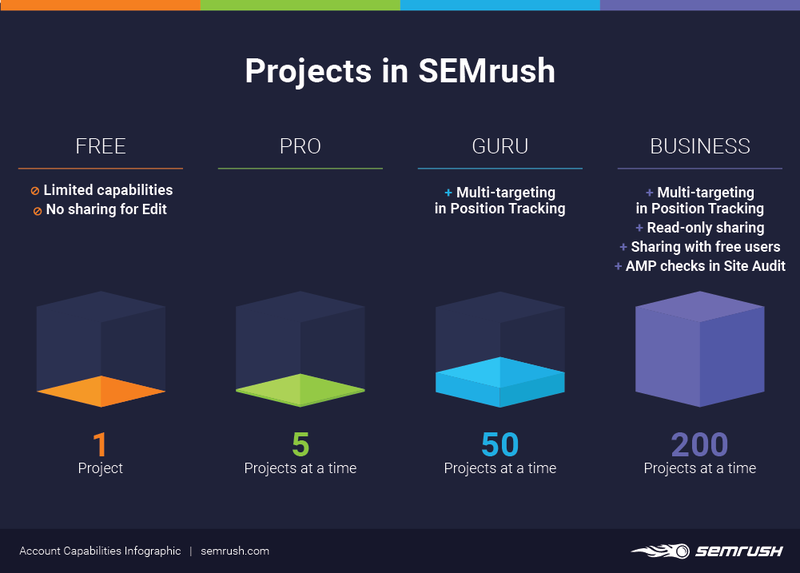 Some of the major SEMrush tools require a preset project. All tools within a single project are focused on the same domain, this way you are able to keep track of your progress. Our Projects section serves as a valuable resource for any digital marketer. Through various tools offered within the Projects interface, users can find powerful information to effectively structure their digital marketing campaigns. Share projects with your colleagues for dynamic and transparent cooperation. You can always delete a project to free up space for a new one, but keep in mind that you will lose all of the previously collected data. Pages to crawl do not roll over each month, however, they reset on the 1st of the month. Once you use up your total amount for the month, you would either need to wait until next month for your limits to be reset, expand your limits, or to upgrade your account to receive more pages. When conducting your Site Audit campaigns, you will want to keep this in mind so that you don’t waste your limits. Since page load speed has a great influence on user experience and is a ranking factor for Google, you can see why AMP becomes an important platform for e-commerce and advertising. You will also want to keep these limits in mind when doing your reporting. If you ever run out of keywords you can always remove individual keywords, remove any projects, buy more keywords, or upgrade your account. Multi-targeting is available to our users with a Guru or higher subscription plan, and allows users to gather rank tracking data for multiple devices and locations simultaneously within the same project (for example, Desktop vs Mobile). Please note: When you add another location or device to your campaign, your account is charged separately for the keywords in the second location. So, a Project tracking the same 10 keywords in 3 different locations costs 30 keywords from your account limits. On Page SEO Checker allows you to pair landing pages with sets of keywords to get recommendations for search engine optimization. If you want to get optimization ideas for 100 keywords 10 times a month you will be spending 1000 keywords. Your limit refreshes each month on the 1st of the month. If you work with social media, you must know how hard it can be to track and analyze the results of your activities, while also keeping an eye on all your competitors. Another big and time-consuming part of a social media specialist’s workflow is managing all of the accounts, scheduling and posting to different social networks. 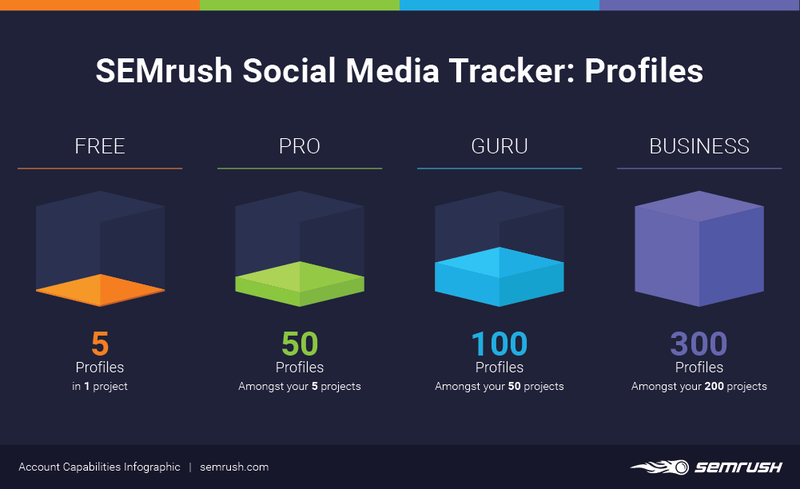 To relieve you from these issues SEMrush designed two specific tools — Social Media Tracker and Social Media Poster. These profiles would be the various competitors you are looking to track within your Social Media campaigns. Let's say you have created a Social Media Tracker project in which you are only tracking Facebook and Twitter. If you were to add two competitors who both have Facebook and Twitter, you would have used up six profiles. Each competitor would have two profiles along with the two profiles you added for your own domain, to give you a total of six profiles. 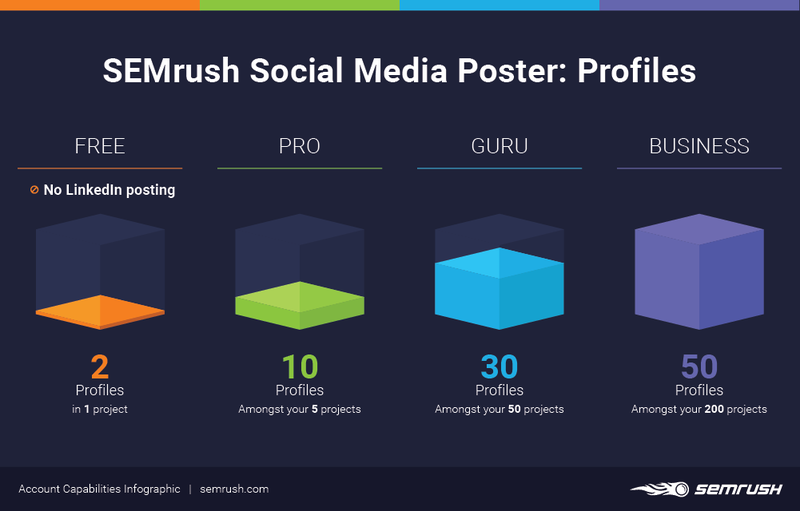 These are the social accounts you can connect to SEMrush in order to post across different social networks from a single tab. Make sure to use the Analytics tab to get a quick analysis of your page’s performance in one easy-to-read table. SEO Content Template analyses your top competitors for your target keywords and provides you with recommendations for creating winning content. Topic Research is a fun tool for content ideation in a creative and informed way, but please note that Free users will only be able to use it twice. 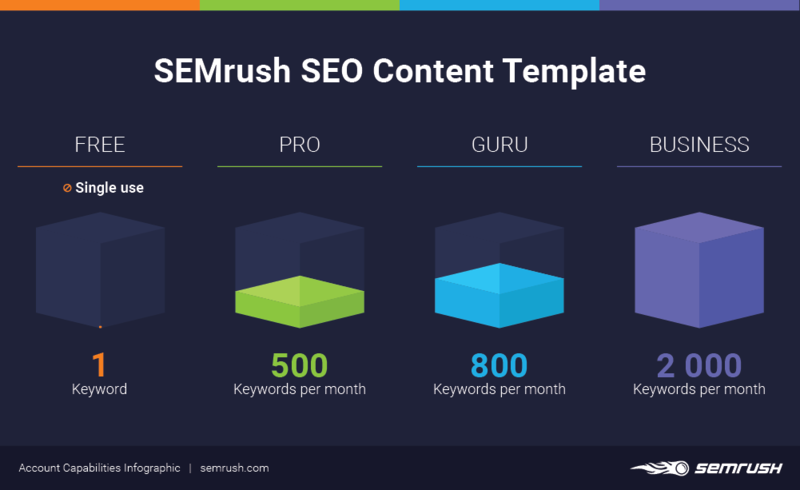 Also, you might want to check out SEMrush SEO Writing Assistant, a free browser extension that integrates SEO Content Template recommendations in your Google Docs. It has the same limits as SEO Content Template does (see above). PPC Keyword Tool makes the job of a PPC specialist much easier by simplifying the planning and setting up of Google Ads campaigns. 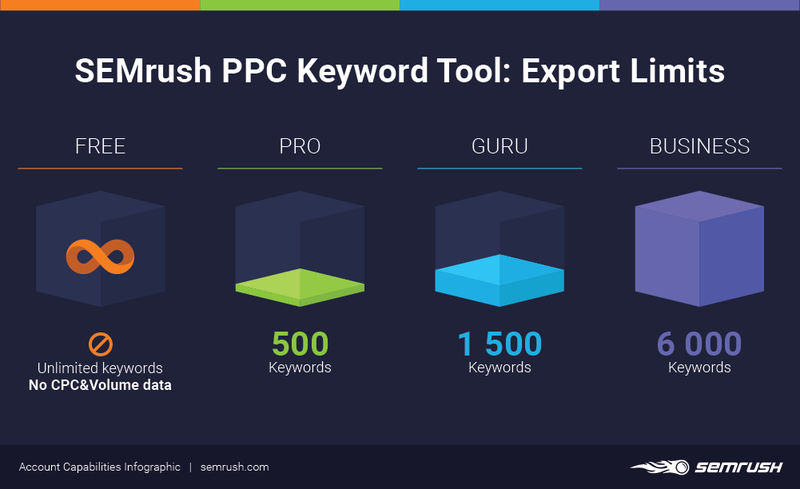 With this tool, you can organize keywords into ad groups and campaigns, receive local volume and CPC data, quickly set up negative keywords and export a campaign plan to import directly into Google Ads. 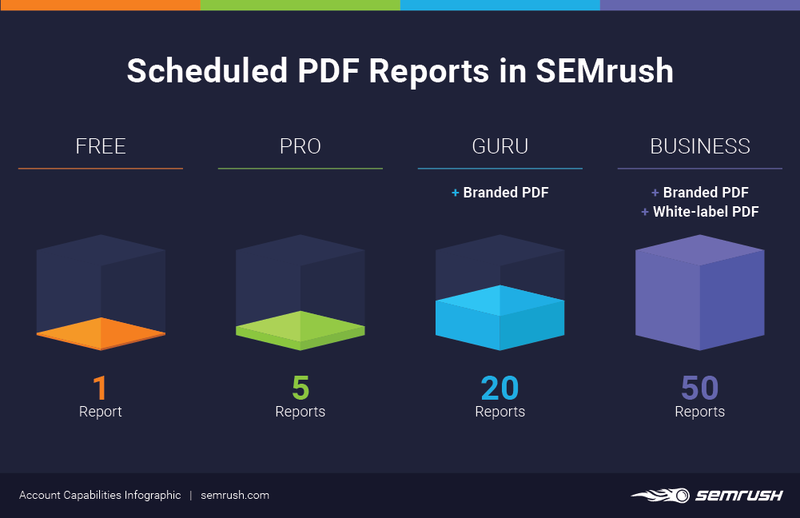 The PDF limitations within your SEMrush account refer to your capabilities within the My Reports section. Every account has the ability to create as many PDF reports as they wish. However, depending on your account, you can only schedule a given number of reports. When it comes to Branded PDF reports, this option is only available at the Guru level or higher. Pro level users will be unable to remove the SEMrush logo from their reports. 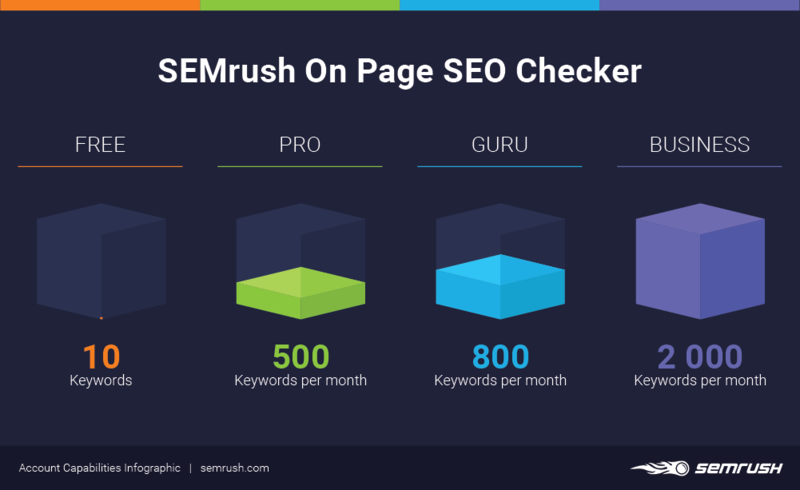 SEMrush does provide a white label option, however, this is only available as an add-on to our Business level package. 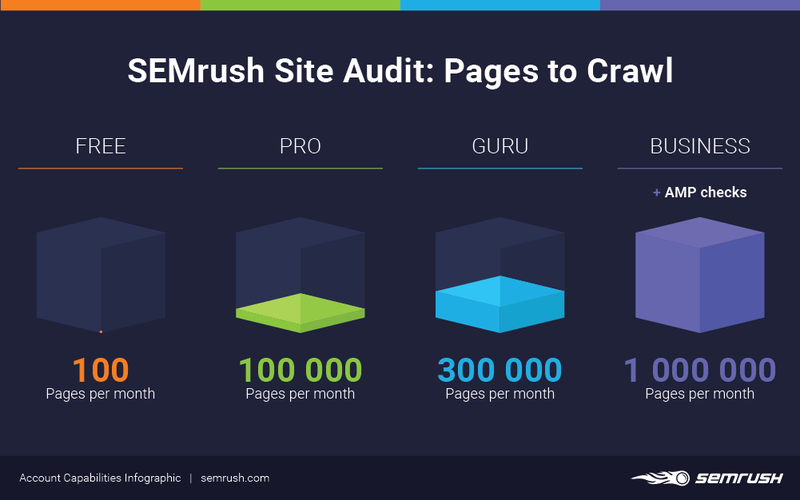 If you have a larger marketing team, you might need to have more than one user per SEMrush account. By default, every plan includes one user, but you can have a maximum of two for Pro, three for Guru, and ten for Business. Application Programming Interface (API) is a way of receiving raw SEMrush data without having to navigate into SEMrush itself. This feature is only available to our Business subscribers. By understanding your account's features and capabilities, you will have a stronger hold on the data we offer. 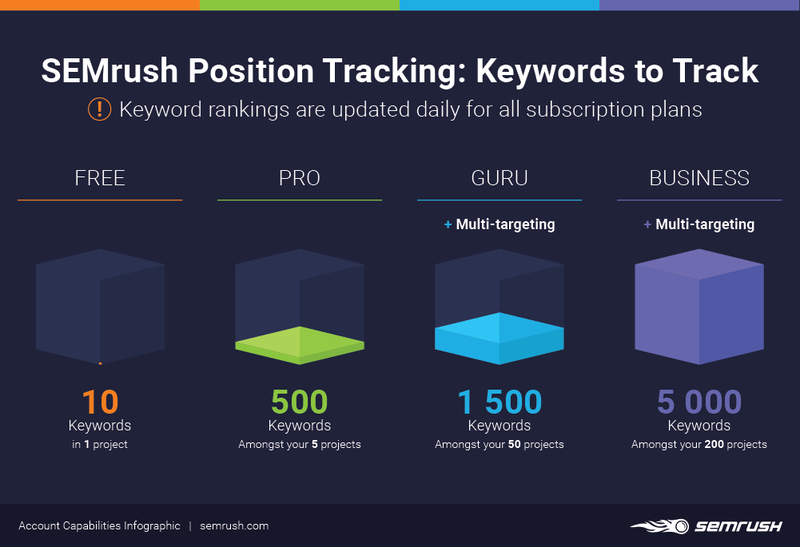 You can use SEMrush for free with limited functionality, or choose one of the three main plans: Pro, Guru, and Business. Please find the pricing for each plan here. If none of these plans fits your marketing needs, contact us to create a flexible custom plan.